Treat yourself or someone special to this luxury sleep set and reed diffuser. 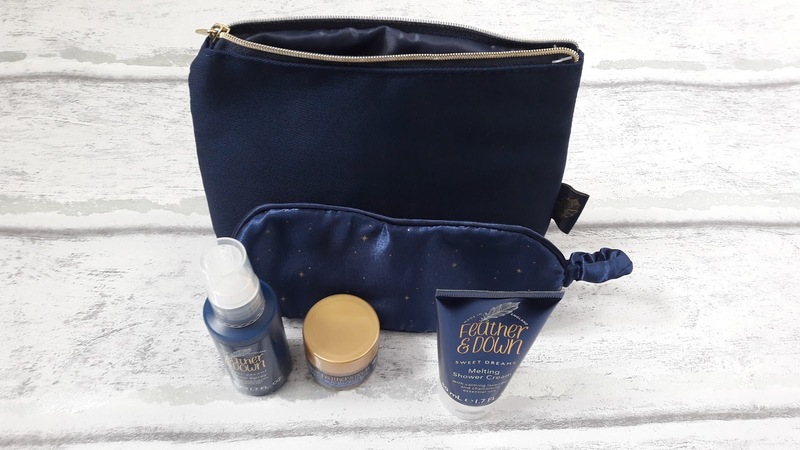 The Feather & Down Sleeping Bag includes a luxury Eye Mask, Sleep Balm, Pillow Spray and Shower Cream. All you need to wind down, relax and encourage that well deserved restful night’s sleep. The scent of lavender and chamomile make this a perfect scent for relaxing you and sending you to the world of nod. Stick to bedtime routines and rituals. A consistent bedtime routine, or a set of specific 'rituals' before lights out, will signal that it's time to sleep. Stick to their usual tea and bedtime routine. Limit the junk food and drinks - bribery to get to bed and sleep ! You'll be grateful come Christmas day and all the family will benefit! let them be over excited, its blooming christmas the next day, that one day a year where they can get caught up in all the magic and excitement of Christmas. If its getting to crazy though, you threaten them with Santa not coming if they dont sleep! Early pjs and get everyone snuggled up on the sofa to watch Elf. Never fails to keep us enthralled and feeling snoozy. I don't have any children so no clue really. Only to say if they don't go to sleep, Santa won't visit! Lots of games and reminding them that Father Christmas is coming so they need to behave! I don't have kids, but I remember when I was little that the only way I went to sleep was by my dad telling me that Father Christmas only comes once I'm asleep. It worked a treat for me! Get them involved with some food prep for Christmas dinner. Even my 3 year old will be getting stuck in too. Mine are teenagers & I am still seeking that tip!!! I even get excited & i am old!! Stick a long film on and watch them fall asleep after five minutes. That is a hard one, as I am just as excited as the kids! I try to tell them a couple of bedtime stories and hope that helps! Stories about the 'naughty list'! I've not yet had an over-excited child on Christmas Eve, but I think the Xmas Eve baskets would really help. I'm not looking forward to the struggles of getting an excited child to sleep! Watch a DVD, read some books or make some gingerbread men to keep them quite and amused. I think bath, low lights and lovely movie under blankets to keep things chilled. A late night - it helps if they are tired. We always go for a walk after dinner and then watch a DVD together. We have a tradition that after dinner, my daughter gets into her pj's, we snuggle on the sofa and I read her The Night Before Christmas. After that we put out the mince pie, glass of milk and carrots for the reindeer, put some magic reindeer food outside to make sure they know where to come and then it's bedtime. A cup of hot chocolate helps to make her sleepy too. Lots of physical activities during the day + a walk on the beach well wrapped up usually does the trick! Hot chocolate & Christmas lights for supper.. glitter out for the reindeer & carrots & mince pies on the hearth.. I used to sit him in his new pajamas and slippers with a Christmas film and sweet minced tarts then prepare Santas tray and off to bed. - Michelle Wild. stick to your usual routine! With my son I start winding him down at 5pm, we have a buffet while watching a movie and I make him up a Christmas eve box with new pjs and a Christmas themed bedtime story to settle down to. Hot chocolates and board games then a cosy bedtime story! Set the clocks at least four hours earlier (it's still dark) and tell them it's much later than it actually is!